The original Kung Fu Panda was the first time I finally felt ok about Jack Black acting. I mean, we didn't have to see some poor actress completely out of his league have to pretend to find him charming or attractive (hello, Kate Winslet in The Holiday) or see him in his underwear (unfortunately, Nacho Libre is seared into my memory). Instead, he embodied a lovable loser panda we could all laugh at while simultaneously root for. 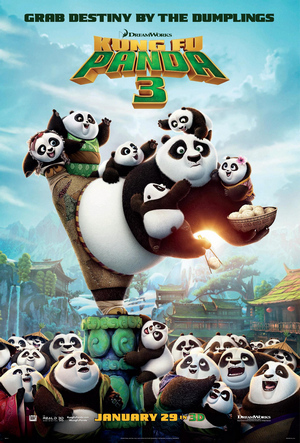 The of course, came Kung Fu Panda 2, which was inevitable, given the success of the first one. It was watchable, though a big step down, like most sequels. And I thought we were done with it. But of course we weren't. Because in a world where studios will continue to wring franchises for every dollar they can get, no matter how little effort is put into the movie, movies like Kung Fu Panda 3 will continue to get made. I'm not saying this is the worst sequel ever made. I'm not even saying it's the worst animated sequel. But in a world where this was released in the theater only mere weeks before Zootopia with the same target audience, I can't help but wonder why moviegoers don't demand higher quality. Does anyone really feel the price of admission was equal for these two movies? How is it possible, knowing the level of quality an animated children's movie can produce, that we can settle for drivel like Kung Fu Panda 3? Honestly, I'm not sure why I even bother asking these questions. After all, it's the same studio that put out 4 (yes, four!) Shrek movies and the spin-off, Puss in Boots. Not to mention both a Christmas and Halloween Shrek movie, because we needed that. Final word: I should probably just start bracing myself for Kung Fu Panda 4.